Wait, don’t forget your wings! Eagle’s wings do not always represent the United States in the Bible! Here are some familiar Bible verses that are typically not fully understood. This Bible verse contains two statements that are seldom taught. First, what does “waiting” on the Lord mean? Well it may mean something to you personally, but it has a very powerful and specific application in scripture. During the Great Tribulation Jerusalem will be overrun by its enemies. The residents of Judea are instructed to flee to the wilderness but the only way for the residents of Jerusalem to survive is not to run away but to “wait” in Mount Zion in Jerusalem. They are “waiting” for the Messiah to save them from their enemies. Isa 25:9 And it shall be said in that day, Lo, this is our God; we have waited for him, and he will save us: this is the LORD; we have waited for him, we will be glad and rejoice in his salvation. 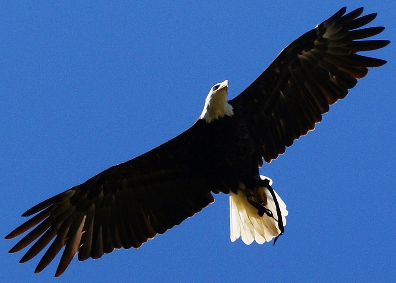 The second statement in Isaiah 40:31 is “they shall mount up with wings as eagles”. Again, this verse may hold some personal meaning, but the term “eagles wings” is used in scripture to indicate God’s supernatural help given to the Israelites in time of flight. It was applied to Israel’s exodus out of Egypt. Exodus 19:4 Ye have seen what I did unto the Egyptians, and how I bare you on eagles’ wings, and brought you unto myself. God carried the Jewish people out of Egypt like an Eagle carries her young. In the next Bible verse Moses explains how an eagle caries her young. Finally God will give “eagles wings” to the residue of the inhabitants of Jerusalem who didn’t run but instead “waited” in Mount Zion at Christ’s return at the end of the “Great Tribulation” (Isa 40:31, Zec 14:3-5). For more Bible verses about Jerusalem read The last Jews in Jerusalem and Jerusalem Behold Your God! If you are looking for the US in Bible Prophecy please read The Leopard is Upon Us! about Daniel chapter 7’s description of the formation of the final gentile world empire. Please explain your view of the role of America and the R.C. Church in prophecy as you do not place any significant emphasis on either of them. Per history, and as of right now, they are both prominent players on the world scene, both politically and religiously. There can be no way that they are not significant in the end times scenario. America will be judged for her many sins and her ungodly influence on all of the nations and the false church for its’ sorceries and indoctrination of the churches at large. Hi DM: Thank you for your thoughtful comment. The U.S. certainly is playing a role in end time prophecy. They are facilitating the Islamic takeover of the Middle East. They are also allowing the formation of a growing Russian Union. Also their stand with Israel is weak. The US is working to create a Palestinian State inside of Israel. John Kerry may be playing the role of the hired shepherd in John 10:11-13. https://hightimetoawake.com/john-1011-13-the-hired-shepherd/. Bible Prophecy emphasizes the old world nations of Northern Egypt, the Middle East, and central Asia. The US is not emphasized in the bible. I see the US represented as the eagles wings in Daniel 7:4.